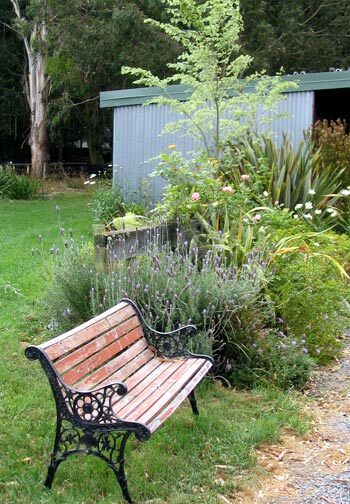 After a garden bench has remained in one position for at least three years, it is courteous to give it a name and a short ceremony of welcome to the permanent garden. Garden Bench Number Two - Welcome to the Moosey garden! 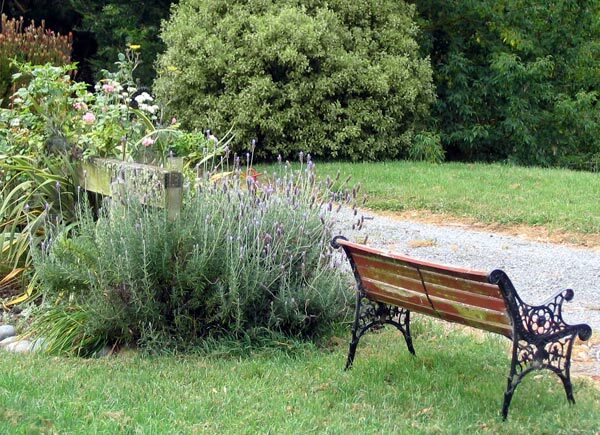 Garden Bench Number Two is by the top driveway, just alongside the lavender which grows at the end of the Stables Border. It is exposed to 360 degree views, and is in full sun. This comfortable park bench is often frequented by my rooster and his small gang of hens. Be warned - and be careful to take a cloth to wipe the wooden slats before sitting down. Garden Bench Number Two isn't exactly romantic and evocative, is it? With sweeping views in all seasons of the lovely Frisbee Lawn, this delightful garden bench really deserves a more descriptive name. The lavender contributes fragrance, nearby trees give shelter from the wind (the newspaper rarely blows away), and you can just hear the babbling, burbling water race at the edge of the lawn. And the sun in winter - just marvellous. And so close to the back door of the house - it's the easiest seat to get to with wobbling cups of hot coffee and the morning newspaper. In fact, you'll often find old cups with coffee dregs drying in the sunshine. Oops! Under serious pressure to perform in the gardening weekend, while deftly backing a trailer-load of compost for me, Non-Gardening Partner ran into the side of Garden Bench Number Two. It's completely 'munted' - the iron rose end-piece has snapped into three. And he never heard a thing!